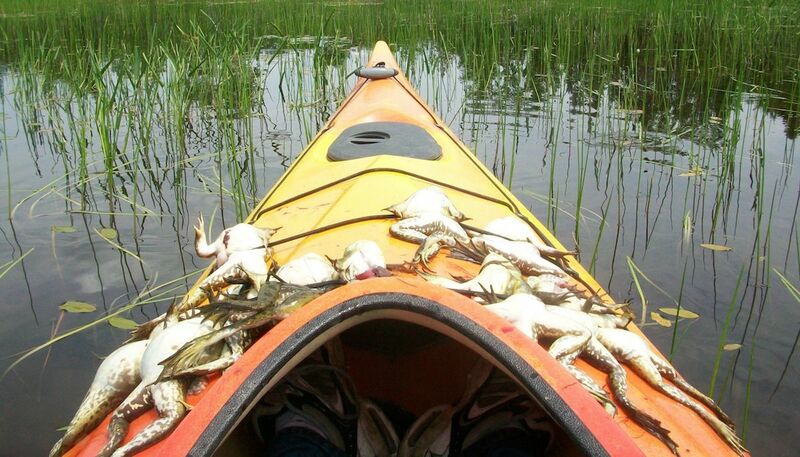 There are big-time benefits to frog gigging by kayak or paddle board. We've listed a few. Plus, read why this is a great way to get a kid outdoors. First off, paddle boards are slowly creeping into the hunting space. Duck hunters and some who bowfish and, yes, gig frogs are finding them to be insanely maneuverable. Plus, standing up verses sitting down offers a number of advantages we'll unpack later. As for kayaks, they offer similar maneuverability and many models are designed for standing up as well as sitting down. Both the kayak and paddle board can get into areas other boats cannot and balance isn't an issue. Some models are so well designed they make even the most un-athletic hunter look like a wide receiver tightroping it down the sideline. BOTE Boards, a paddle board manufacturer based in Florida, released a promotional video featuring two young outfitters who guide duck hunts and fishing trips in Venice, Louisiana. You can watch the video and see how the paddle board allows uncommon versatility and performs well in shallow water. This is Jackson Kayak's Cuda HD. It's designed for anglers to stand up or sit down while fishing. Stand up. The vantage point from the standing position is an asset to those who like to bowfish thanks to the benefit of looking down into the water rather than looking across the top water. Same goes for frog gigging. But not only are you at an advantage based on what you can see, it also improves how precisely and quickly you can hit a frog. Two-man job, becomes a one-man job. In a john boat, often you'll have one person who paddles and another who spotlights. But with a kayak or stand-up board, you can manage the whole affair solo. If you're gonna gig alone, make it safe and wear a life vest or, alternatively, the most productive and safest approach is to use the kayak or board to make gigging a one-man job, but hit the water with a buddy who's manning another area on another board. He or she can work one side of the bank, while you're working the other for a bigger haul. This is a BOTE paddle board with a mounted motor. Quiet Approach. Both the kayak and paddle board are built to maneuver with ease. They're light and move very little water allowing for a subtle and quiet approach. The key component here is to ditch a hand-held spotlight and rely on a powerful headlamp, so hands are free to guide the approach and ready the spear. Georgia Outdoor News writer Craig James recommends those who plan to go frog gigging be armed with top-shelf lighting. “Right off I’m gonna tell you, don’t cut any corners here,” James wrote. “I don’t care how good your gig is or how nice your kayak is, without light you can’t see. I favor the new lights that operate for many hours on a couple batteries. Just be sure to invest in some good batteries, and always bring a few spares." Containment for Small Children. Containment. That sounds like it's not the best word for this usage. You contain germs, yes, and pond dams contain water. But those with kids know what I mean, especially small children. As a parent, you want them to go along and get out and have a little adventure, but often manageable adventures are reduced to driving through McDonald's for a chocolate milkshake. Keep in mind the balance of the paddle board is often just as secure as that of a kayak, and kids can manage it just fine. Here's the author's husband and 6-year-old son paddling the Edisto River in South Carolina. But frog gigging can be a legit adventure that's actually doable. It doesn't require the maturity and focus of hunting, and frog gigging offers action and a high rate of success. It's a fun, summertime adventure. Kids like being outdoors and they like having a project that suggest they're grown up. Going out and sticking frogs for supper is a self-sufficient badge of honor. But, depending on where you frog gig, the terrain can get a little dicey. For one, it's usually muddy. Tall grass is common and things often go "slither in the night." That makes a boat ideal. Kayaks and paddle boards work well. Keep in mind, the balance of the paddle board is often just as secure as that of a kayak and kids can manage it just fine. But any boat works great. Canoes and john boats are particularly great for kids. If a kid is too small and hasn't yet acquired the hand-eye coordination he or she will need to stand and spear a bullfrog, put them in charge of a spotlight. Tell them they're the scouts of your frog-gigging company, gathering intel from the pond banks. It's a critical job and it's the kid's job. They'll be so stoked. Thaw a possession limit of frog legs (16 pairs), drain and pat dry with paper towels. Heat oil to 375 degrees. Combine dry ingredients in a large plastic bowl with lid. Dip legs into milk and egg mixture, then drop into bowl with dry ingredients. Cover bowl and shake. Drop legs in hot oil and cook until golden brown. This is part 2 of a three-part series on frog gigging. To read frog-gigging basics, check out part 1 of the series. Part 3 covers bullfrog basics and why it benefits amphibians to gig some bullfrogs.